With his hustle, talent and attitude towards the game, Todd Helton cards and autographed memorabilia were popular with collectors. When he was in his prime, Helton was on the bubble of the hobby's top tier. That slipped somewhat as his career wound down but he's still one of the most recognized names from the first decade of the new millennium. Todd Helton played his entire 17-year career with the Colorado Rockies. An accomplished hitter, Helton finished his career holding virtually every offensive team record. His lifetime batting average of .316, to go along with 2,519 hits, and 1,406 runs batted in, are further evidence of his strong play. The only Todd Helton rookie card is from 1993 Topps Traded Baseball. It depicts him as a member of Team USA. 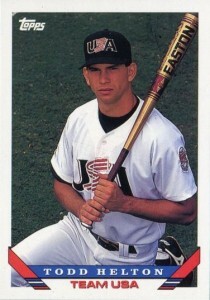 Helton would make is MLB debut in 1997. He has several other cards leading up to his rookie season including relatively popular cards in 1996 Topps Chrome and 1996 Bowman's Best. Helton's first certified autograph is from 1996 Signature Rookies Old Judge Peak Picks, a relatively obscure minor league release. His first MLB autograph is included in the 1997 Donruss Signature Series set. The base version is serial numbered to 1,400. The card also has two parallels numbered to 1,000 and 100. Todd Helton's first game-used memorabilia cards were issued by Fleer and Upper Deck in 1999. His Winning Materials jersey card from 1999 SPx is a favorite. With his impressive big-league resumé, Helton's autographed memorabilia is a good value and has solid potential for growth. Single-signed baseballs and signed Helton model bats are key pieces for getting signed. 1993 Topps Traded was issued as a factory sealed set. As a result, the Helton rookie card is often found in Mint condition. Professionally graded samples in top condition are plentiful. This ready supply has also brought prices down in recent years. 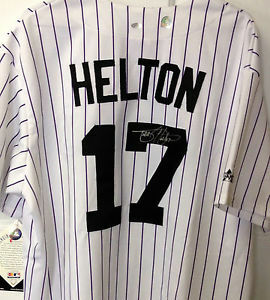 Below you will find an example of what Todd Helton's authentic signature looks like. This can be used as a first point of reference for determining the legitimacy of autograph memorabilia, but is not a substitute for having your items authenticated by a well-respected professional autograph authentication company. Some of the trusted sources within the sports memorabilia market include the following companies: PSA, JSA, Steiner, Mounted Memories and Tristar. Click on any of the images below to view full size photos. It is a very hard-to-decipher signature in terms of letter-by-letter analysis. The signature consists of several looping letters and rounded lines. Look for two horizontal loops on either side of the center of the signature.